“The Hanging Garden has plants cultivated above ground level, and the roots of the trees are embedded in an upper terrace rather than in the earth. The whole mass is supported on stone columns… Streams of water emerging from elevated sources flow down sloping channels… These waters irrigate the whole garden saturating the roots of plants and keeping the whole area moist. Hence the grass is permanently green and the leaves of trees grow firmly attached to supple branches… This is a work of art of royal luxury and its most striking feature is that the labor of cultivation is suspended above the heads of the spectators”. More recent archaeological excavations at the ancient city of Babylon in Iraq uncovered the foundation of the palace. Other findings include the Vaulted Building with thick walls and an irrigation well near the southern palace. A group of archaeologists surveyed the area of the southern palace and reconstructed the Vaulted Building as the Hanging Gardens. However, the Greek historian Strabo had stated that the gardens were situated by the River Euphrates. So others argue that the site is too far from the Euphrates to support the theory since the Vaulted Building is several hundreds of meters away. They reconstructed the site of the palace and located the Gardens in the area stretching from the River to the Palace. On the river banks, recently discovered massive walls 25 m thick may have been stepped to form terraces, the ones described in Greek references. Ancient Egyptian hieroglyphic records dating back to several hundred years BC describe the growing of plants in water along the Nile without soil. There are also reports that the Roman Emperor Tiberius grew the cucumbers he craved out of season via water culture. A primitive form of hydroponics has also been carried on in Kashmir for centuries. 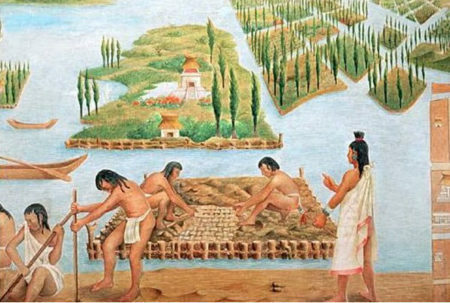 The floating gardens of the Aztecs of Central America are another example. A nomadic tribe, they were driven onto the marshy shore of Lake Tenochtitlan, located in the great central valley of what is now Mexico. Roughly treated by their more powerful neighbors, denied any arable land, the Aztecs survived by exercising remarkable powers of invention. Since they had no land on which to grow crops, they determined to manufacture it from the materials at hand. In what must have been a long process of trial and error, they learned how to build rafts of rushes and reeds, lashing the stalks together with tough roots. Then they dredged up soil from the shallow bottom of the lake, piling it on the rafts. Because the soil came from the lake bottom, it was rich in a variety of organic debris, decomposing material that released large amounts of nutrients. These rafts, called Chinampas, had abundant crops of vegetables, flowers, and even trees planted on them. The roots of these plants, pushing down towards a source of water, would grow though the floor of the raft and down into the water. These rafts, which never sank, were sometimes joined together to form floating islands as much as two hundred feet long. Some Chinampas even had a hut for a resident gardener. On market days, the gardener might pole his raft close to a market place, picking and handing over vegetables or flowers as shoppers purchased them. By force of arms, the Aztecs defeated and conquered the peoples who had once oppressed them. Despite the great size their empire finally assumed, they never abandoned the site on the lake. Their once crude village became a huge, magnificent city and the rafts, invented in a gamble to stave off poverty, proliferated to keep pace with the demands of the capital city of Central Mexico. Upon arriving to the New World in search of gold, the sight of these islands astonished the conquering Spaniards. Indeed, the spectacle of an entire grove of trees seemingly suspended on the water must have been perplexing, even frightening in those 16th century days of the Spanish conquest. William Prescott, the historian who chronicled the destruction of the Aztec empire by the Spaniards, described the Chinampas as “Wondering Islands of Verdure, teeming with flowers and vegetables and moving like rafts over the water”. Chinampas continued in use on the lake well into the nineteenth century, though in greatly diminished numbers. The earliest recorded scientific approach to discover plant constituents was in 1600 when Belgian Jan van Helmont showed in his classical experiment that plants obtain substances from water. He planted a 5-pound willow shoot in a tube containing 200 pounds of dried soil that was covered to keep out dust. After 5 years of regular watering with rainwater he found the willow shoot increased in weight by 160 pounds, while the soil lost less than 2 ounces. His conclusion that plants obtain substances for growth from water was correct. However, he failed to realize that they also require carbon dioxide and oxygen from the air. In 1699, John Woodward, a fellow of the Royal Society of England, grew plants in water containing various types of soil, the first man-made hydroponics nutrient solution, and found that the greatest growth occurred in water that contained the most soil. Since they knew little chemistry in those days, he was not able to identify specific growing elements. He thereby concluded that plant growth was a result of certain substances and minerals in the water, derived from enriched soil, rather than simply from water itself. In the decades that followed Woodward’s research. European plant physiologists established many things. They proved that water is absorbed by plant roots, that it passes through the plant’s stem system, and that it escapes into the air through pores in the leaves. They showed that plant roots take up minerals from either soil or water, and that leaves draw carbon dioxide from the air. They demonstrated that plants roots also take up oxygen. Further progress in identifying these substances was slow until more sophisticated research techniques were developed and advances were made. The modern theory of chemistry, which made great advances during the seventeenth and eighteenth centuries, subsequently revolutionized scientific research. Plants, when analyzed, consisted only of elements derived from water, soil and air. In 1792 the brilliant English scientist Joseph Priestley discovered that plants placed in a chamber having a high level of “Fixed Air” (Carbon Dioxide) will gradually absorb the carbon dioxide and give off oxygen. Jean Ingen-Housz, some two years later, carried Priestley’s work one step further, demonstrating that plants set in a chamber filled with carbon dioxide could replace the gas with oxygen within several hours if the chamber was placed in sunlight. Because sunlight alone had no effect on a container of carbon dioxide, it was certain that the plant was responsible for this remarkable transformation. Ingen-Housz went on to establish that this process worked more quickly in conditions of bright light, and that only the green parts of a plant were involved. In 1804, Nicolas De Saussure proposed and published, results of his investigations that plants are composed of mineral and chemical elements obtained from water, soil and air. 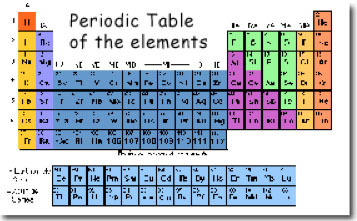 By 1842 a list of nine elements believed to be essential to plant growth had been made out. These propositions were later verified by Jean Baptiste Boussingault (1851), a French scientist who began as a mineralogist employed by a mining company, but turned to agricultural chemistry in the early 1850s. By feeding plants with water solutions of various combinations of soil elements growing in pure sand, quartz and charcoal (an inert medium not soil), to which were added solutions of known chemical composition. He concluded that water was essential for plant growth in providing hydrogen and that plant dry matter consisted of hydrogen plus carbon and oxygen which came from the air. He also stated that plants contain nitrogen and other mineral elements, and derive all of their nutrient requirements from the soil elements he used, he was then able to identify the mineral elements and what proportions were necessary to optimize plant growth, which was a major breakthrough. In 1856 Salm-Horsmar developed techniques using sand and other inert media. Various research workers had demonstrated by that time that plants could be grown in an inert medium moistened with a water solution containing minerals required by the plants. The next step was to eliminate the medium entirely and grow the plants in a water solution containing these minerals. From discoveries and developments in the years 1859-1865 this method was proven by two German scientists, Julius von Sachs (1860), professor of Botany at the University of Wurzburg (1832-1897), and W. Knop (1861), an agricultural chemist. Knop has been called “The Father of Water Culture”. In that same year (1860), von Sachs published the first standard formula for a nutrient solution that could be dissolved in water and in which plants could be successfully grown. This marked the end of the long search for the source of the nutrients vital to all plants. This was the origin of “Nutriculture” and similar techniques are still used today in laboratory studies of plant physiology and plant nutrition. These early investigations in plant nutrition demonstrated that normal plant growth can be achieved by immersing the roots of a plant in a water solution containing salts of nitrogen (N), phosphorus (P), sulfur (S), potassium (K), calcium (Ca), and magnesium (Mg), which are now defined as the macroelements or macronutrients (elements required in relatively large amounts). With further refinements in laboratory techniques and chemistry, scientists discovered seven elements required by plants in relatively small quantities – the microelements or trace elements. These include iron (Fe), chlorine (Cl), manganese (Mn), boron (B), zinc (Zn), copper (Cu), and molybdenum (Mo). The addition of chemicals to water was found to produce a nutrient solution that would support plant life, so that by 1920 the laboratory preparation of water cultures had been standardized and the methods for their use were well established. In following years, researchers developed many diverse basic formulas for the study of plant nutrition. Some of these workers were Tollens (1882), Tottingham (1914), Shive (1915), Hoagland (1919), Deutschmann (1932), Trelease (1933), Arnon (1938) and Robbins (1946). Many of their formulas are still used in laboratory research on plant nutrition and physiology today. Interest in practical application of this “Nutriculture” did not develop until about 1925 when the greenhouse industry expressed interest in its use. Greenhouse soils had to be replaced frequently to overcome problems of soil structure, fertility and pests. As a result, research workers became aware of the potential use of Nutriculture to replace conventional soil cultural methods. Prior to 1930, most of the work done with soilless growing was oriented to the laboratory for various plant experiments. Nutriculture, chemiculture, and aquiculture were other terms, used during the 1920s and 1930s to describe soilless culture. Between 1925 and 1935, extensive development took place in modifying the laboratory techniques of Nutriculture to large-scale crop production. In the late 1920s and early 1930s, Dr. William F. Gericke of the University of California extended his laboratory experiments and work on plant nutrition to practical crops growing outside for large scale commercial applications. In doing so he termed these Nutriculture systems “hydroponics”. The word was derived from two Greek words, hydro, meaning water and ponos meaning labor – literally “water-working”. His work is considered the basis for all forms of hydroponic growing, even though it was primarily limited to the water culture without the use of any rooting medium. Hydroponics is now defined as the science of growing plants without the use of soil, but by use of an inert medium, such as gravel, sand, peat, vermiculite or sawdust, to which is added a nutrient solution containing all the essential elements needed by the plant for its normal growth and development. Since many hydroponic methods employ some type of medium that contains organic material like peat or sawdust, it is often termed “soilless culture”, while water culture alone would be true hydroponics. Today, hydroponics is the term used to describe the several ways in which plants can be raised without soil. These methods, also known generally as soilless gardening, include raising plants in containers filled with water and any one of a number of non-soil mediums – including gravel, sand, vermiculite and other more exotic mediums, such as crushed rocks or bricks, shards of cinder blocks, and even styrofoam. There are several excellent reasons for replacing soil with a sterile medium. Soil-borne pests and diseases are immediately eliminated, as are weeds. And the labor involved in tending your plants is markedly reduced. More important, raising plants in a non-soil medium will allow you to grow more plants in a limited amount of space. Food crops will mature more rapidly and produce greater yields. Water and fertilizer are conserved, since they can be reused. In addition, hydroponics allows you to exert greater control over your plants, to unsure more uniform results. All of this is made possible by the relationship of a plant with its growing medium. It isn’t soil that plants need – it’s the reserves of nutrients and moisture contained in the soil, as well as the support the soil renders the plant. Any growing medium will give adequate support. And by raising plants in a sterile growing medium in which there are no reserves of nutrients, you can be sure that every plant gets the precise amount of water and nutrients it needs. Soil often tends to leach water and nutrients away from plants, making the application of correct amounts of fertilizer very difficult. In hydroponics, the necessary nutrients are dissolved in water, and this resulting solution is applied to the plants in exact doses at prescribed intervals. Until 1936, raising plants in a water and nutrient solution was a practice restricted to laboratories, where it was used to facilitate the study of plant growth and root development. Dr. Gericke grew vegetables hydroponically, including root crops, such as beets, radishes, carrots, potatoes, and cereal crops, fruits, ornamentals and flowers. Using water culture in large tanks in his laboratory at the University of California, he succeeded in growing tomatoes to heights of 25 feet. Photographs of the professor standing on a stepladder to gather in his crop appeared in newspapers throughout the country. Although spectacular, his system was a little premature for commercial applications. It was far too sensitive and required constant technical monitoring. Many would-be hydroponic growers encountered problems with the Gericke system because it required a great deal of technical knowledge and ingenuity to build. Gericke’s system consisted of a series of troughs or basins over which he stretched a fine wire mesh. This in turn was covered by a mulch of straw or other material. The plants were placed on this mesh, with the roots extending downward into a water/nutrient solution in the basin. One of the main difficulties with this method was keeping a sufficient supply of oxygen in the nutrient solution. The plants would exhaust the oxygen rapidly, taking it up through the roots, and for this reason it was imperative that a continuous supply of fresh oxygen be introduced into the solution through some method of aeration. Another problem was supporting the plants so that the growing tips of the roots were held in the solution properly. In 1936, W. F. Gericke and J. R. Travernetti of the University of California published an account of the successful cultivation of tomatoes in a water and nutrient solution. Since then a number of commercial growers started experimenting with the techniques, and researchers and agronomists at a number of agricultural colleges began working to simplify and perfect the procedures. Numerous hydroponic units, some on a very large scale, have been built in Mexico, Puerto Rico, Hawaii, Israel, Japan, India, and Europe. In the United States, without much public awareness, hydroponics has become big business, more than 500 hydroponic greenhouses have been started. Dr. Gericke’s application of hydroponics soon proved itself by providing food for troops stationed on non-arable islands in the Pacific in the early 1940s. The first triumph came when Pan American Airways decided to establish a hydroponicum on the distant and barren Wake Island in the middle of the Pacific Ocean in order to provide the passengers and crews of the airlines with regular supplies of fresh vegetables. Then the British Ministry of Agriculture began to take an active interest in hydroponics, especially since its potential importance in the Grow-More-Food Campaign during the 1939-1945 war was fully realized. During the late 1940s, Robert B. and Alice P. Withrow, working at Purdue University, developed a more practical hydroponic method. They used inert gravel as a rooting medium. By alternately flooding and draining the gravel in a container, plants were given maximum amounts of both nutrient solution and air, supplied to the roots. This method later became known as the gravel method of hydroponics, sometimes also termed nutriculture. In wartime the shipping of fresh vegetables to overseas outposts was not practical, and a coral island is not a place to grow them. Hydroponics solved the problem. During World War II, hydroponics, using the gravel method, was given its first real test as a viable source for fresh vegetables by the U. S. Armed Forces. In 1945 the U. S. Air Force solved its problem of providing its personnel with fresh vegetables by practicing hydroponics on a large scale giving new impetus to the culture. One of the first of several large hydroponics farms was built on Ascension Island in the South Atlantic. Ascension was used as a rest and fuel stop by the United States Air Force, and the island was completely barren. Since it was necessary to keep a large force there to service planes, all food had to be flown or shipped in. There was a critical need for fresh vegetables, and for this reason the first of many such hydroponic installations established by our armed forces was built there. The plants were grown in a gravel medium with the solution pumped into the gravel on a preset cycle. The techniques developed on Ascension were used in later installations on various islands in the Pacific such as Iwo Jima and Okinawa. On Wake Island, an atoll in the Pacific Ocean west of Hawaii, normally incapable of producing crops, the rocky nature of the terrain ruled out conventional farming. The U. S. Air Force constructed small hydroponic growing beds there that provided only 120 square feet of growing area. However, once the operation become productive, it’s weekly yield consisted of 30 pounds of tomatoes, 20 pounds of string beans, 40 pounds of sweet corn and 20 heads of lettuce. The U. S. Army also established hydroponic growing beds on the island of Iwo Jima that employed crushed volcanic rock as the growing medium, with comparable yields. During this same period (1945), the Air Ministry in London took steps to commence soilless culture at the desert base of Habbaniya in Iraq, and at the arid island of Bahrain in the Persian Gulf, where important oil fields are situated. In the case of the Habbaniya, a vital link in Allied communications, all vegetables had had to be brought by air from Palestine to feed the troops stationed there, an expensive business. Both the American Army and the Royal Air Force opened hydroponic units at military bases. Many millions of tons of vegetables produced without soil were eaten by Allied Soldiers and Airmen during the war years. After World War II the military command continued to use hydroponics. For example, The United States Army had a special hydroponics branch, which grew over 8,000,000 lbs. of fresh produce during 1952, a peak year for military demand. They also established one of the worlds largest hydroponic installations, a 22 hectare project at Chofu, Japan. It became necessary to use hydroponics in Japan because of the method of fertilization of the soil by the Japanese. It had been their practice for many years to use “Night Soil”, containing human excreta as a fertilizer. The soil was highly contaminated with various types of bacteria and amoeba, and although the Japanese were immune to these organisms, the occupying troops were not. Covering 55 acres, it was designed to produce both seedlings and mature vegetables for American occupation forces. It remained in operation for over 15 years. The largest hydroponic installations up to that time were built in Japan using the gravel culture method. Some of the most successful installations have been those at isolated bases, like Guyana, Iwo Jima and Ascension Island. After World War II, a number of commercial installations were built in the United States. The majority of these were located in Florida. Most were out of doors and subject to the rigors of the weather. Poor construction techniques and operating practices caused many of them to be unsuccessful and production inconsistent. However, the commercial use of hydroponics, grew and expanded throughout the world in the 1950s to such countries as Italy, Spain, France, England, Germany, Sweden, the USSR and Israel. One of the many problems encountered by the early hydroponics pioneers was caused by the concrete used for the growing beds. Lime and other elements leached into the nutrient solution. In addition, most metal was also affected by the various elements in the solution. In many of these early gardens, galvanized and iron pipe were used. Not only did they corrode very quickly, but elements harmful or toxic to the plants were released into the nutrient solution. Nevertheless, interest in hydroponic culture continued for several reasons. First, no soil was needed, and large a plant population could be grown in a very small area. Second, when fed properly, optimum production could be attained. With most vegetables, growth was accelerated and, as a rule, the quality was better than that of soil grown vegetables. Produce grown hydroponically had much longer shelf life or keeping qualities. Many of the oil and mining companies built large gardens at some of their installations in different parts of the world where conventional farming methods were not feasible. Some were in desert areas with little or no rainfall or subsurface waters, and others were on islands, such as those in the Caribbean, with little or no soil suitable for vegetable production. Big commercial American headquarters in the Far East have over 80 acres devoted to vegetable units, to feed landless city dwellers, while various oil companies in the West Indies, the Middle East, the sandy wastes of the Arabian Peninsula and the Sahara Desert, operating in barren areas, especially off the Venezuelan Coast at Aruba and Curacao, and in Kuwait have found soilless methods invaluable for ensuring that their employees get a regular ration of clean, health-giving vegetables. In the United States extensive commercial hydroponics exist, producing great quantities of food daily, especially in Illinois, Ohio, California, Arizona, Indiana, Missouri and Florida. Also there has been a development of soilless culture in Mexico and neighboring areas of Central America. In addition to the large commercial systems built between 1945 and the 1960s, much work was done on small units for apartments, homes, and back yards, for growing both flowers and vegetables. Many of these were not a complete success because of a number of factors: poor rooting media, the use of unsuitable materials (particularly in constructing the troughs used as growing beds), and crude environmental control. Even with the lack of success in many of these ventures, however, hydroponic growers the world over were convinced that their problems could be solved. There was also a growing conviction in the minds of many that the perfection of this method of growing food was absolutely essential in light of declining food production and the worldwide population explosion. Recent surveys have indicated that there are over 1,000,000 household soil-less culture units operating in the United States for the production of food alone. Russia, France, Canada, South Africa, Holland, Japan, Australia and Germany are among other countries where hydroponics is receiving much attention. In addition to the work being done to develop hydroponics systems for the production of vegetables, between 1930 and 1960 similar work was being conducted to develop a system to produce livestock and poultry feed. Researchers had found that cereal grains could be grown very rapidly in this manner. Using grains such as barley, they proved that 5 pounds of seed could be converted into 35 pounds of lush green feed in 7 days. When used as a supplement to normal rations, this green feed was extremely beneficial for all types of animals and birds. In lactating animals, milk flow was increased. In feedlots, better conversion rates and gains were achieved at less cost per pound of grain. In breeding stock the potency of males and conception in females increased dramatically. Poultry also benefited in many ways. Egg production increased while cannibalism, a constant problem for poultry raisers, ceased. Here again, however, in developing a system that would produce consistently, a number of problems arose. The early systems had little or no environmental control, and with no control of temperature or humidity, there was a constant fluctuation in the growth rate. Mold and fungi in the grasses were an ever-present problem. The use of thoroughly clean seed grain with a high germination ratio was found to be absolutely essential if a good growth rate was to be achieved. Nevertheless, in the face of these and other obstacles, a few researchers continued to work to perfect a system that could produce this feed continuously. With the development of new techniques, equipment, and materials, units became available that were virtually trouble free. Many of these are in use today on ranches, farms, and in zoos all over the world. Hydroponics did not reach India until 1946. In the summer of that year the first research studies were commenced at the Government of Bengal’s Experimental Farm at Kalimpong in the Darjeeling District. At the very beginning a number of problems peculiar to this sub-continent had to be faced. Even a cursory study of the various methods which were being practiced in Britain and in America revealed how unsuited they were for general adoption by the public of India. Various physiological and practical reasons, in particular the elaborate expensive apparatus required, were sufficient to prohibit them. A novel system, of which practicability and simplicity must be the keynotes, would have to be introduced if hydroponics was to succeed in Bengal, or in fact ever to prove of widespread value to the people of this part of Asia. 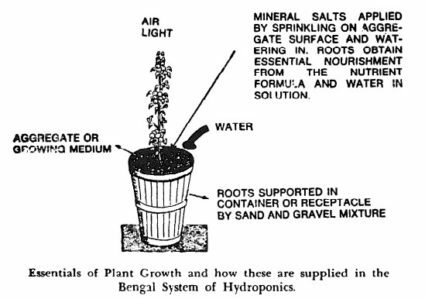 Careful appraisal of salient problems during 1946-1947 resulted in the development of the Bengal System of hydroponics, which represented an effort to meet Indian requirements. With the development of plastics, hydroponics took another large step forward. If there is one single factor that could be credited with making the hydroponics industry the success it is today, that factor is plastics. One of the most pressing problems encountered everywhere was the constant leaching of detrimental elements into the solution from concrete, rooting media, and other materials. With the advent of fiberglass and such plastics as the different types of vinyl, polyethelene film, and the many kinds of plastic pipe, this problem was virtually eliminated. In the better producing systems being built in the world today plastics are used throughout, and other than a few isolated bronze valves, there is absolutely no metal. Even the pumps are epoxy coated. Using these types of materials, along with an inert material as a rooting medium, the grower is well on his way to success. Plastics freed growers from the costly construction associated with the concrete beds and tanks previously used. Beds are scraped out of the underlying medium and simply lined with a heavy vinyl (20 mil), then filled with the growing medium. With the development of suitable pumps, time clocks, plastic plumbing, solenoid valves and other equipment, the entire hydroponic system can now be automated, or even computerized, reducing both capital and operational costs. A problem that has developed in the past few years is the ever-increasing cost of energy for heating. In many areas the high cost of fuel has caused a number of installations that were operating at a profit to suddenly plunge deeply into the red, and some operators have been forced to shut down entirely in the colder months. Since this is the time of year when vegetables are at or near peak prices, these increased fuel costs have had a disastrous effect on the industry as a whole. One bright spot in this picture is the development of solar heating systems. Much research has and is being done in this field, and there are many ready-built systems available on the market today. Also available are a number of publications with detailed plans on how to build one’s own solar energy system. There will of course, be many new developments in this field over the next few years, and solar energy may eventually solve the dilemma for all growers. Currently, plans are being drawn for using the techniques of soilless culture on space flights and even on the moon, or beyond. For hydroponics, the future seems very bright. The cost to the would-be commercial grower for a properly designed hydroponic system, housed in a manner that provides good environmental control, can run into thousands of dollars. For this reason, one should check very closely the qualifications of the seller. He or she should require proof of claims regarding production and profit capability, back-up service after the sale, research facilities and past records of the manufacturing company. If a person is willing to work and apply him-or-herself, plants can be grown hydroponically by a complete novice with no past experience at growing crops. The owner of a small 10×12 foot hydroponic greenhouse will be able to produce all the fresh vegetables needed by a family of four or five, provided he or she operates the unit on a year round basis. Hydroponics can also be profitable on a commercial scale if the grower devotes the time and attention required for any successful business. The average yield of tomatoes per acre is eighteen times greater than in conventional soil methods.